Island Spiced Bakes & Bites sells handcrafted delicious treats with a Caribbean soul. They are most famous for their Caribbean style rum cake and various flavors of shortbread. On the weekends, Debb and Avril head out to various local farmers markets and festivals where they sell their mouth-watering desserts. The relationship between Constellation and Island Spiced Bakes & Bites is a special one with a humble beginning after representative Linley Branham tasted a pineapple rum cream cake and was amazed by the delicious flavor. She now works closely with the duo, helping out at festivals and markets by booking their booth spot and standing by their side as they sell their products. Because of the high-priced vendor booth fees at these markets and festivals, Constellation has agreed to cover the cost so that Debb and Avril can sell their cakes stress-free. Debb says, “The support and encouragement from Constellation allows us visibility in a place where we wouldn’t normally be by virtue of the cost alone.” The love between Constellation and Island Spied Bakes & Bites is mutual. 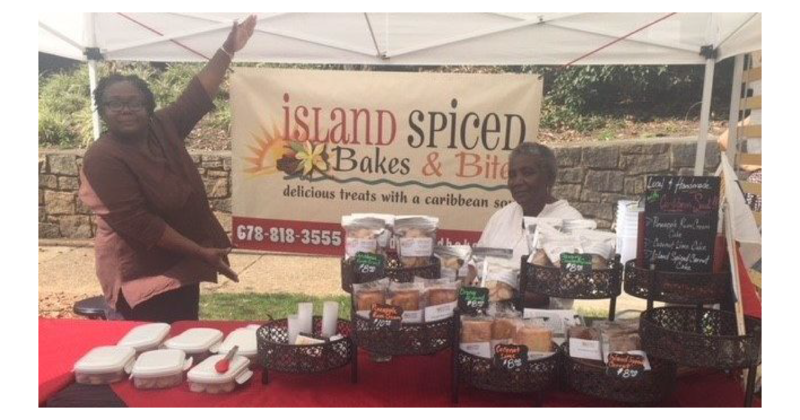 Representative Linley Branham says, “it has been a joy to bring Island Spiced Bakes & Bites to festivals around Atlanta and see people’s faces light up when they taste the products. 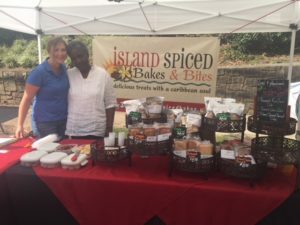 It is amazing to see Debb and Avril’s humble gratitude for Constellation’s support.” In addition to paying their vendor fee, Constellation purchases Island Spiced Bakes & Bite’s products to put in a welcoming local vendor basket that is given to new families in the area. The energetic, happy doublet are two peas in a pod; even their birthdays are only a day apart. On any given day you can catch them in the kitchen together baking and laughing for hours at a time. On the other hand, Avril has found solace in mastering the art of cake baking. She follows her traditional recipes precisely to come out with the perfect product. Because of her traditional spirit and baking style, she sometimes laughs and wonders how her daughter can be so adventurous with spices and flavors. “I have a creative soul, I look at things differently, and get my inspiration from trying something different,” says Debb who is no stranger to trying new recipes and concoctions in the kitchen, sometimes spending months perfecting a recipe from taste tests alone. For Debb, baking is calming and a way of fighting stress. No matter the recipe, she always starts with her family’s basic pound cake recipe that has been passed down over the years and then adds different flavors and spices until it’s perfect. Once she gets going she can’t stop, sometimes staying up late, her creative passion fueling her to find new flavor combinations and recipes. Though they have different baking styles, the mother and daughter pair couldn’t be more devoted to each other and their business. “Anything that I can do with my mom is interesting…sometimes we argue and sometimes we are so in-sync it’s unbelievable, but through it all, she is my hero. I look at her and think ‘gosh I want to be like her when I grow up.’” says Debb. Avril’s positive attitude is inspiring not only to her daughter but to the people around her. Her warm spirit draws people in but she is humble and lets the flavors speak for themselves. As people approach the vendor booth at festivals, Avril’s welcoming attitude keeps people coming back for more samples and cakes. The products from Island Spiced Bakes and Bites are each one of a kind and packed with spice, flavor, and love. When a festival or market is on the horizon, Debb and Avril spend the day cooking together to prepare. Their movements are synchronous and united as they make their way around the kitchen efficiently working towards their goal. For the famous Rum Cake, fruit is soaked in rum and spice for over nine months to achieve the rich flavor. By the time Avril is ready to bake the cakes, the fruit has disintegrated and the Rum mix is ready to collide with other ingredients. The cakes are not mass produced, each one is handcrafted, packaged, and sold, giving each customer a unique and flavorful experience. If your mouth is watering, order Island Spiced Bakes & Bites here! Follow Constellation’s Facebook page for more small business updates here.